Elegant Engagements Wedding and Event Planners: It's an Airplane! For my son's first birthday I decided to do an airplane themed party. Invitations were boarding passes for GJT Airlines. I made tons of mini airplanes out of fun foam, they hung from the light fixtures and ceiling fan. 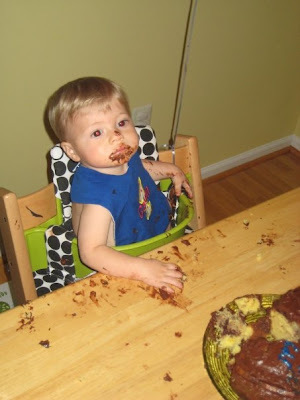 Even on his own cake. The adults devoured pumpkin or chocolate cupcakes with airplane / 1 toppers. I had airplane sugar cookies and along with a platter of Philly pretzel bites, a custom G pretzel. I made a 'wall of Gavin' which included pictures from every month of his first year. I also made a Happy Birthday Gavin sign using scrapbook paper and grosgrain ribbon. Inspiration from Etsy. When guests arrived they had to check in to get airplane stickers and when they left they picked up their favors at baggage claim. 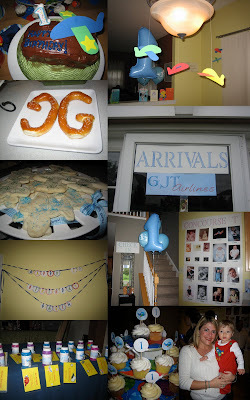 Favors were bubbles with labels that said 'Thank you for flying GJT Airlines' and personalized luggage tags. I think I love planning kids birthday parties as much as weddings!! I love it! What a lucky little guy. Happy belated birthday Gavin! This is so cute! Love the idea and all the little details. Check out http://www.labelsonthefly.com/birthday-labels.html for more great ideas and to get custom birthday stickers, hang tags, and note cards!